The new Kinder High School for the Performing and Visual Arts building has been named a Houston Business Journal 2019 Landmark Award finalist. The annual awards program recognizes impressive real estate projects that make a significant impression on the Houston landscape and help sculpt the look, feel, and image of the city. This entry was posted in 2012 bond, 21st century schools, Achievement/Recognition, Business Operations, District VIII - Diana Dávila, Magnet/School Choice, New schools, News on February 28, 2019 by HISD Communications. Besides being delicious and nutritious, what do tortillas, skim milk, and watermelon all have in common? The items were part of Nutrition Services’ winning menu for the Texas Department of Agriculture’s 2018 Farm Fresh Challenge, which encourages schools to incorporate local foods into their menus and garden-based learning activities into their curriculum. This entry was posted in Food Services, News, Nutrition Services on February 28, 2019 by HISD Communications. Milby High School Culinary Arts Program student Roberto Blas knows how something as simple as a conversation can change your life. During the summer of 2018, Blas had a conversation about his future plans with Nutrition Services Officer Betti Wiggins in Washington, D.C. at the national Cooking Up Change competition for high school students. This entry was posted in Business Operations, Career/technical education (CTE), Food Services, News, Nutrition Services on February 7, 2019 by HISD Communications. Transportation Services will host its third round of Coffee & Conversations on Wednesday — an opportunity for the department to share important updates and progress, as well as gather feedback to better identify ongoing challenges. The bi-monthly meetings are normally held in the morning and evening at rotating locations. This time, the group will gather at Transportation Services’ Northwest Terminal and Eastwood Academy. This entry was posted in Business Operations, Elementary Schools, High Schools, Middle Schools, News, Parents, Transportation on January 24, 2019 by HISD Communications. Milby High School recently was transformed into the site of an exciting cooking competition — complete with four celebrity chefs — as part of the Schwan’s Chef Collective K-12 Kitchen Collaborative Mystery Ingredient Cook-Off. This entry was posted in Business Operations, Food Services, Nutrition Services on December 20, 2018 by HISD Communications. 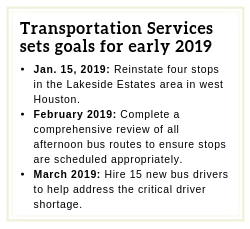 When the spring semester starts in January, HISD’s Transportation Services will be operating 860 bus routes — 41 routes fewer than they did at the end of September. This entry was posted in Business Operations, Elementary Schools, High Schools, Middle Schools, News, Parents, Transportation on December 19, 2018 by HISD Communications. Construction on the final building phase of Worthing High School is nearing 100 percent completion, with students and staff eager to move into the new facility next month. As crews complete final punch-list items, new furniture will be delivered in the coming weeks, preparing the building for students when they return from winter break on Jan. 7. This entry was posted in 2012 bond, 21st century schools, Building Updates, Business Operations, District IX - Wanda Adams, News and tagged 2012 bond, Worthing, Worthing High School, Worthing HS on December 14, 2018 by HISD Communications. Transportation Services has updated all bus routes assigned to Kinder High School for Performing and Visual Arts in preparation for their relocation to their new campus in downtown Houston. The school is moving out of its current campus in Montrose and into a new building located at 790 Austin St. during the upcoming winter break. The new facility, built as part of the 2012 Bond Program, will officially open its doors to students when they return from winter break on Jan. 7, 2019. This entry was posted in Business Operations, Elementary Schools, High Schools, Middle Schools, Parents, Transportation on December 13, 2018 by HISD Communications. Transportation Services is conducting a comprehensive review of all afternoon bus routes to ensure all stops are scheduled appropriately and all routes can be completed safely in the time allotted. This analysis comes on the heels of a similar review of all morning bus routes, which is wrapping up. Department staff are expected to complete the review and make any necessary route changes by February 2019. This entry was posted in Business Operations, Elementary Schools, High Schools, Middle Schools, Parents, Transportation and tagged Transportation Services on December 6, 2018 by HISD Communications. Thanksgiving is approaching quickly, and parents of Walnut Bend Elementary School students visited the school on Thursday to enjoy a hearty Thanksgiving lunch with their children. The special celebration, occurring during normal lunch hours, is an HISD tradition that has attracted thousands of families to school cafeterias for more than 50 years. The event gives parents a chance to celebrate the holiday a week early by sharing a meal with their children. This entry was posted in Business Operations, Food Services, Holidays, Nutrition Services on November 15, 2018 by HISD Communications.